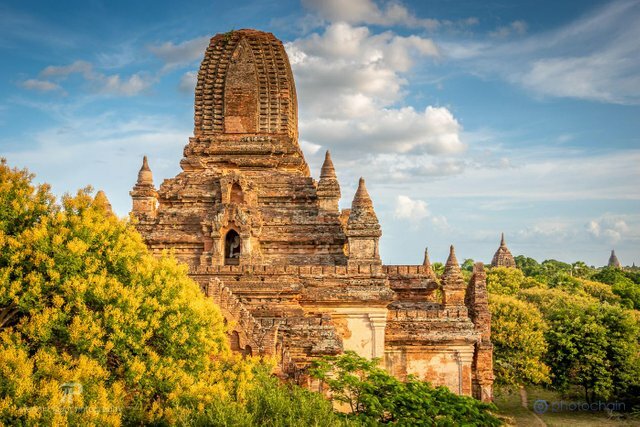 Bagan is an incredible place: Thousands of temples are spread over the area that was once the capital of an ancient kingdom. The first day I had rented a bicycle to explore the temples, but I quickly realised that in the mid-day heat an electric scooter was the better choice. I explored many remote temples where I did not see any other visitors for hours! I have also submitted this photo to the Asian Sunday contest by @czechglobalhosts. I captured this photo with my Nikon D5500* and a Sigma ART 18-35 mm f/1.8* lens. By the time you read this, this post or some of the posts below may be older than 7 days so you can not vote for them anymore. If you want to support me, please consider voting on one my recent daily posts! If you like my content, don't forget to upvote this post and follow me for more photos and travel stories! Also, I will be happy if you leave a comment to tell me your thoughts and resteem this post to share my work! *Affiliate link. Shop on Amazon using this link to support me - it doesn't cost you more than a click! Beautiful photo, Julian. It must have been quite the experience to explore ruins all by yourself! It was so amazing, I had expected much more tourism there! Sweet layers! Great work. Resteemed. It’s amazing that you didn’t see other visitors in some of these temples in hours! Beautiful photo! Thanks for sharing @jpphotography! It was so cool, I had expected to see much more tourists there! Your UA account score is currently 4.405 which ranks you at #2109 across all Steem accounts. In our last Algorithmic Curation Round, consisting of 477 contributions, your post is ranked at #101. Hello @jpphotography, thank you for sharing this creative work! We just stopped by to say that you've been upvoted by the @creativecrypto magazine. The Creative Crypto is all about art on the blockchain and learning from creatives like you. Looking forward to crossing paths again soon. Steem on!